The Temple of Elemental Evil is a classic adventure. Normally, a group of players who complete all the content in the module move on to other adventures, explore other planes, etc. But what if the world of Greyhawk was a little less Wild West and a little more feudal? Here's what they could do if they use my castle building rules instead. The Viscount of Verbobonc is building a motte-and-bailey-type castle in the village. Burne and Rufus are essentially acting as the barons of Hommlet, although the feudal structure seems fairly loose and typically ill-defined. The new castle has barely been started and, without a huge influx of workers and money, won't be completed for decades. The Ruins of the Moathouse. Eyeballing it, the ruins are about 17 miles from the village of Hommlet. for a Generic Medieval large army on the move, the Moathouse is located within a useful force projection distance of Hommlet, but is too far away to adequately protect the village. This fits the building's stated purpose: a forward base, a raiding outpost, and a bastion of control. It also explains why the Viscount is building a new castle rather than reclaiming this one. If the Viscount was smart, he'd cut open the old road between Hommlet and the Moathouse and cart the pre-cut stone back to Hommlet. Assuming the road could be leveled, it's a 2 or 3 day journey at worst. This could be an excellent mercantile venture for the PCs. Hire people to clear the road and cart stone back to town, then settle in Hommlet. There seems to be an abundance of unworked land; I'm sure the Viscount wouldn't mind more farmers. Anyway, the ruins of the Moathouse could be repaired fairly easily. By my quick math, there are ~44 5'x5'x5' cubes that need to be repaired. That's about 1/2 of a "standard" 100 [cube] job, so the PCs could get it done in 6 months using these rules. But the Moathouse is not a good choice unless the PCs can establish a village or another venture within its walls. Far better to pull it down and render it unusable, after all the easily used stone has been removed. The quickest method is undermining. Tunnel under the walls, supporting the tunnel with wooden beams. Then, when ready, fill the tunnel with straw and burn it. The resulting collapse should take the walls and towers down. Magic might perform the same role. 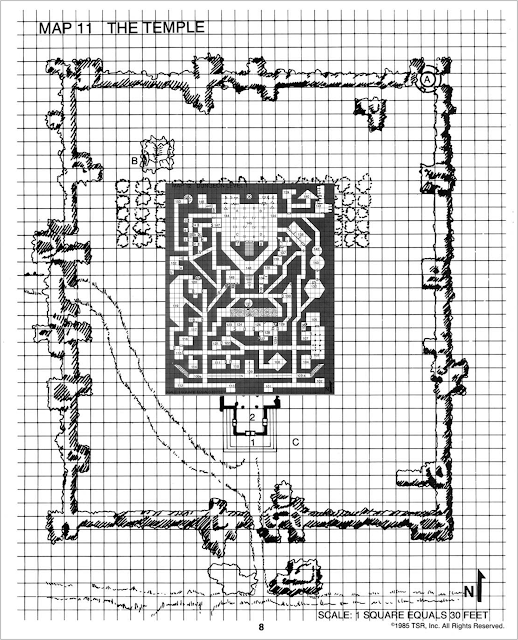 You could even use the pre-existing dungeon level to undermine the castle. In any event, you don't want to leave anything that could be used as a fortress by bandits or other nobles. As a fortress, the castle has many advantages: an inexhaustible source of fresh water, nearly intact walls, and a good defensible location. The only issue is that there is nothing to defend. Mine the Moathouse for stone to build the castle in Hommlet. Collapse the remains. Alternatively, rebuilding it, build wooden walls, and settle a village nearby. The temple is approximately 30 miles from Hommlet. It's practically in another barony by feudal standards. It is out of adequate force projection range, even if Hommlet had force to project, which it does not. The disreputable village of Nulb, incidentally, seems like the perfect sort of village to pacify with a large castle and garrison. 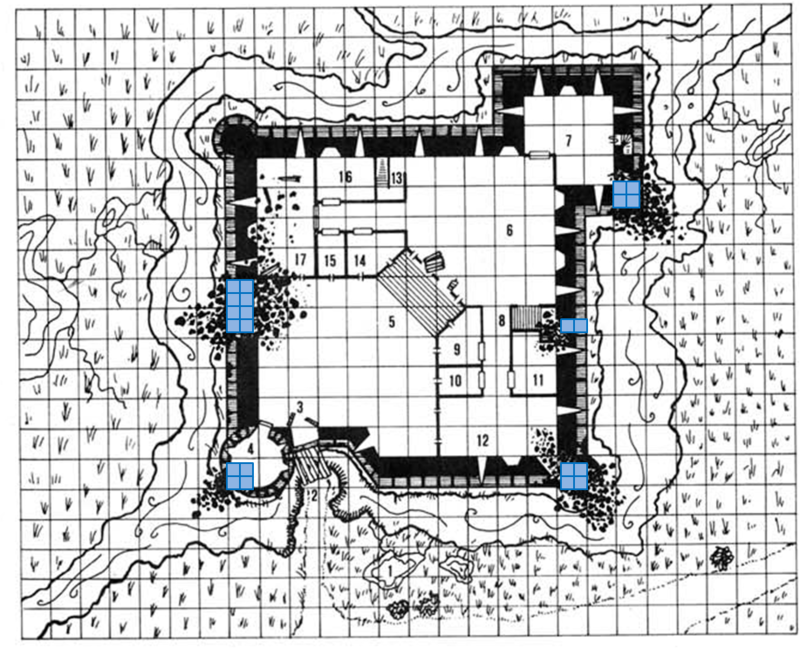 According to the map, the Temple of Elemental Evil is only a mile or two outside of town. The town is already a trading hub. It has a river. It's perfect. So the PCs do PC things and punch Evil in the face. The cloud of purple prose is dispersed. Songbirds sing in the trees, etc, etc. Time to build a pacification castle on a monumental scale. This is far beyond the usual requirements of a castle-building system, but I want to stress-test my idea. 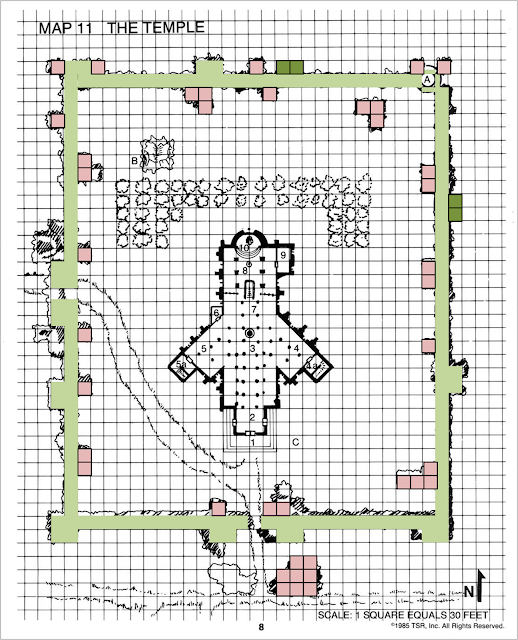 Most castles will involve 100-300 5'x5'x5 [cubes]. This one requires... significantly more. The Temple, with an overlay showing where Levels 1 and 2 of the dungeon are located. Areas of Levels 1 and 2 it is possible to safely excavate. 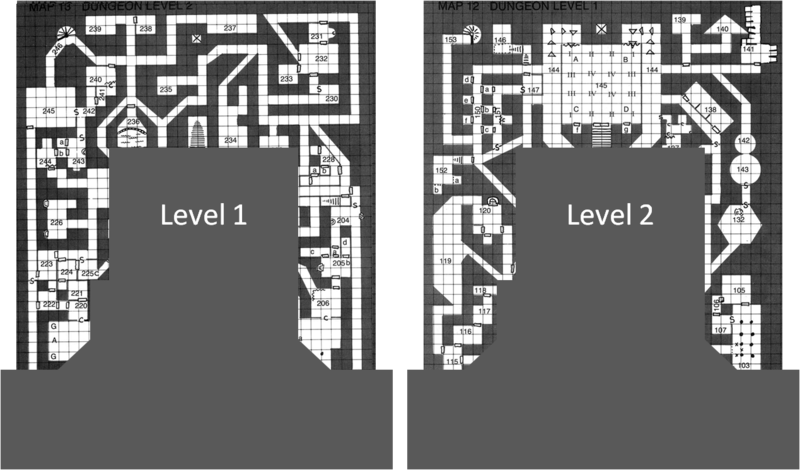 The rest of the dungeon is either too deep or under a load-bearing wall. We can get some stone from the remains of the wall itself, but most of the stone will need to be quarried from the dungeon. I'd say that the top two levels are easily quarried. The rest is too deep and too dangerous to raise. We also can't quarry underneath the Temple itself without collapsing it, limiting our areas to the ones marked. Most of the corridors are 20' or 30' tall in the module, which will certainly make excavating sufficient stone blocks easy. The exterior walls of the temple have been "razed", but there's not much other information on their status. I'm going to assume that there's a good foundation left and plenty of stones to raise the walls to 10' in all the areas marked in light green. Those bits are, essentially, intact. The areas marked in red (40 30'x30'x10' squares) are extra stone from collapsed towers, etc. 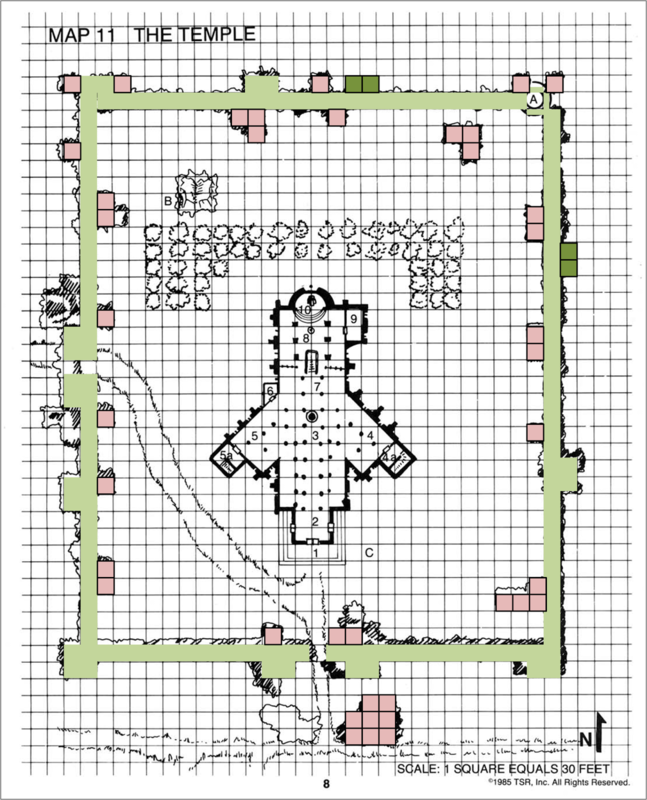 The squares marked in dark green (4x 30'x30'x30' squares) are towers or blocks we need to build. With our "standard" team, moving all that stone into place would take 110 years. Clearly that's not feasible. While the master builder and the PCs work on the drawings and clearing the shrubbery, some of the PCs go off to raise money and petition the Viscount and the King (presumably of Furyondy). But we also want to raise the walls slightly, from 10' to 15'. We therefore need 1,500 10'x10'x5' blocks, or 6,000 5'x5'x5' [cubes]. 6,300 [cubes], leaving us with 5,700 to use on the rest of the castle. The outer walls of the Temple are 30' tall, with a 20' peaked roof on top. You might be tempted to use the core of the building as a castle, but it's stated clearly that the walls are buttressed. It's a cathedral, and cathedrals are easy to knock down. They are designed to be beautiful, not defensible. It's more sensible to build a new castle. The possible sites are limited by the existing walls, the temple, and the excavations. We can't build the castle on the north end of the site because most of the area will be excavated to 20 or more to bring up stones. The southeast corner seems sensible. The outer walls (blue) require 157 10'x10'x10' cubes per level, and we need 3 levels to match the 30' high temple, so that's 3,800 5'x5'x5' [cubes]. That leaves us with 1900 5'x5'x5' [cubes] for the rest of the castle. There are plenty of iron grates and surprise portcullises in the dungeon, so outfitting the gatehouses won't be an issue. The doors in the dungeon are also made of sturdy hardwoods. We don't need many stones here compared to the other projects. The keep will be built into the very large circular tower inside the castle itself, but we want to make it substantial, with thick walls and proper supports. Budget 900 5'x5'x5' [cubes] for miscellaneous projects, a courtyard, improved bridges, a larger gatehouse, etc. 1 master builder, who costs 5gp per month or 60 gp per year. 100gp per month, or 1,200gp per year, in incidental costs, food, temporary shelters, church services, specialists, smiths, roof tiles, firewood, and other horrible and tedious expenses. For a grand total cost of 165gp per month, or 1,980gp per year. We have 10,000 5'x5'x5 [cubes] in this project, give or take. With the rates above, it will take us 100 years to complete the castle. First, we need to massively increase the labour force. Rather than 100 labourers, 10 masons, and 1 master builder, we can recruit 5x as many. The time is reduced to 25 years. This also increases our costs, but we are using obligated labour, so it could be worse. We now pay 6,900gp per year. Second, we can also increase the amount we spend on specialists and extra supplies by 5x again, for a staggering 34,500gp per year, to reduce the total construction time to 5 years. The total annual revenues of a rich Count are ~10,000-20,000gp per year in my system*, so this project requires a truly staggering financial investment. The cost will probably be split between the King (1/4), the Viscount (1/8) and the PCs (5/8) or some other equally unfair ratio. The PCs merely need to come up with 110,000gp. *Nobles can increase their revenue by increasing taxes, warfare, ransoms, and other means, so the annual revenue listed is biased low. I'm also tweaking this post slightly for revenue at the County level. Luckily the PCs should have an enormous stock of ready cash from their tomb-looting adventure. They also may have magic items and other tricks to reduce construction time and cost. The Undead work for free, and a few Earth Elementals would make short work of an excavation. The PCs can also take out loans, perform heists, offer land in exchange for specialized services, and perform a thousand other tricks to whittle down the enormous cost. If the PCs do build the castle, they will be the lords of an entire region. The walls of the Temple of Elemental Evil are large enough to enclose an entire medieval town. 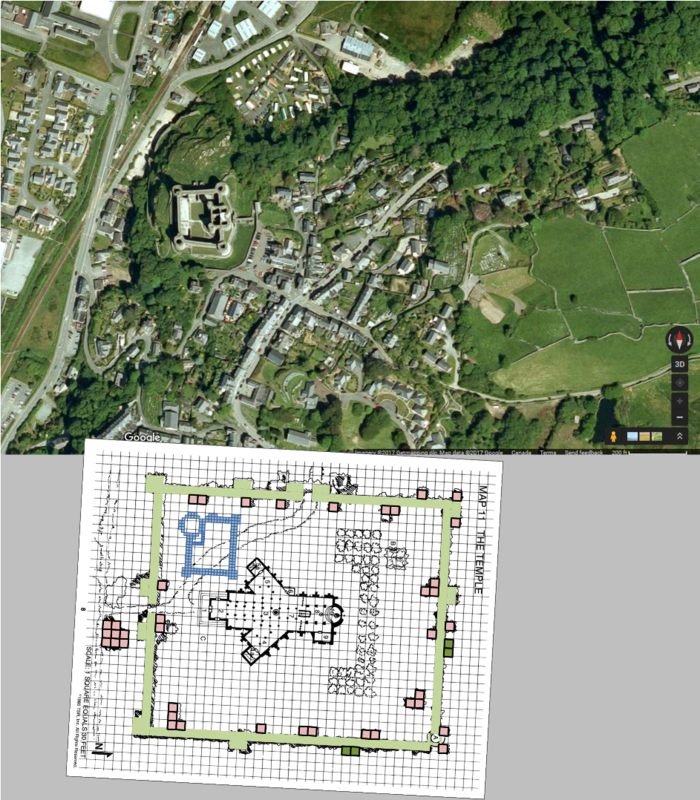 Here's how the castle would look compared to Castell Harlech. You could easily fit a town inside the walls. 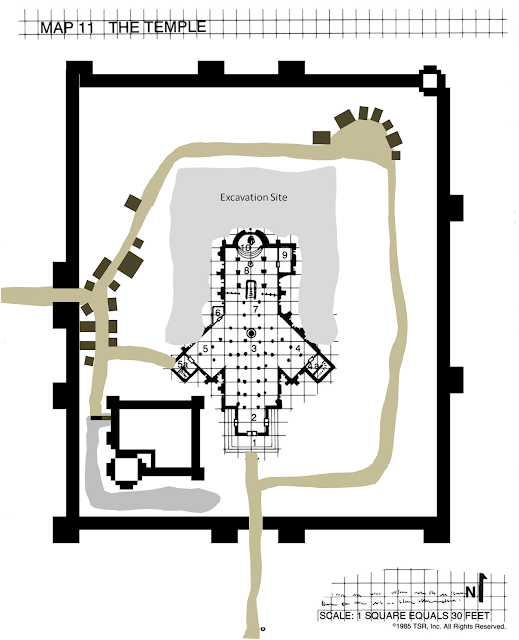 The north corner will be temporarily covered by the excavation, but once the excavation is complete, the area can be filled in and occupied. Ever wondered why there are always weird monsters and cults in the sewers of medieval towns? This is why. 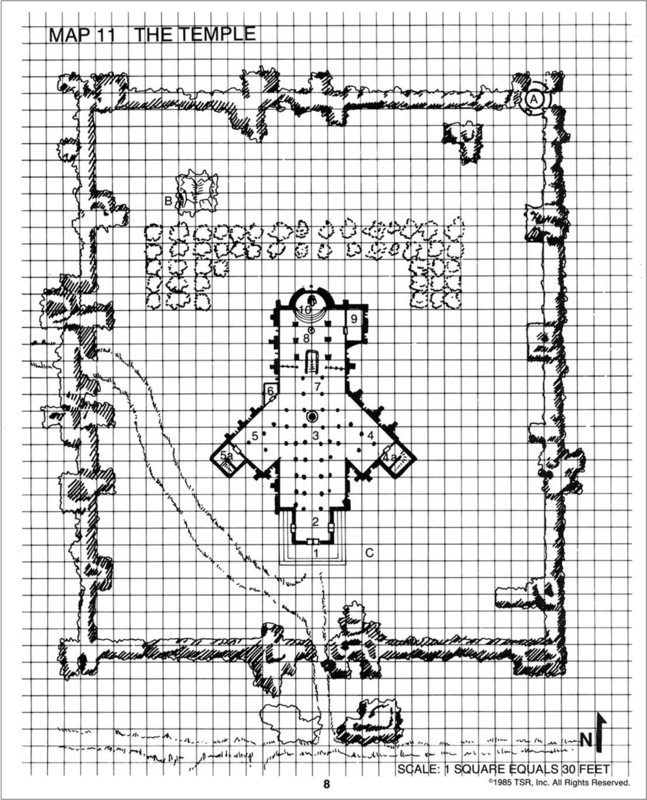 The Temple of Elemental Evil could (with new sculptures and a thorough consecration) become a grand cathedral. A town with a pre-built cathedral, with access to river trade, good fields, and lots of free land would attract many settlers and displaced peasants. The start of a town inside the walls. If the PCs can acquire investment from the King, the Viscount, and any other powers who have a stake in the region, they can convert the Temple of Elemental Evil into a very well-defended town in 5 years. They can attract workers and settlers with grants of land, but most of the new arrivals will be recruited from the Viscount and King's domains. I wouldn't be surprised if people from unwalled Hommlet move to the new walled site. The benefits are vast. With a fortified town in place, the local rulers can control river traffic, pacify any bandits, and impose law and taxation on the area. The village of Nulb is poor, but the land itself isn't, it seems. Those repeated "fires and flash floods" from when the Temple was active might have improved the soil. The hills seem suitable for sheep farming. The hills around the Temple, and the stone under the Temple, seem to be made of limestone (although Gygaxian Geology would require an entirely new post to explain). If the hills are actually limestone a quarry could be set up or restarted. It would also provide a very sturdy fortress on the border of the Faerie Kingdom of Celene. Do you have a patreon or something? Your blog is one of my favorites, thanks for the awesome work.